We use our Hoop House to extend our seasons. In the Spring, we plant our tomatoes in the hoop house several weeks before we can outside, giving us an early and lengthened harvest. The hoop house also protects our precious crops from the elements, allowing large beautiful Tomatoes to grow to their potential without being damaged. In the Fall and Winter months, the hoop house enables us to grow a wide variety of leafy greens, herbs, and root crops, which would not survive outdoors. Because of our hoop house we can supply root crops in the fall, winter and spring . 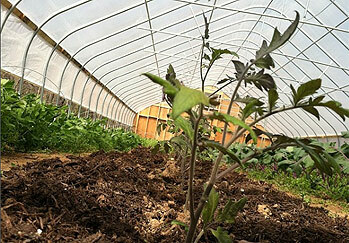 Our Gothic Style Hoop House is 30x100 Feet and has no artificial heat sources. It uses multiple layers of plastic to keep the heat in, and has sides that roll up to let the heat out. 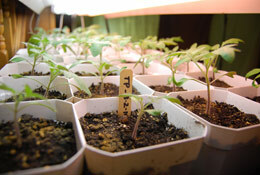 Seedlings already well on their way. Early tomatoes already rising up for an early start. 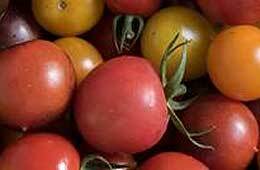 Cherry tomatoes keep out of the cold and thrive.